Bring your own ukulele, or borrow one of ours! No experience necessary! 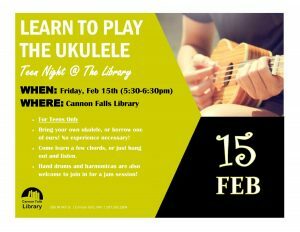 Come learn a few chords, or just hang out and listen. Hand drums and harmonicas are also welcome to join in for a jam session. Posted in News, Programs, Teen Programs.